The family room in Servant Branch's center at River Ridge provides a congenial site for get-togethers such as the senior luncheon. I’m sitting in the living room of Jack and Florence Wright (Servant Branch), in a sunny open-plan apartment in Bloomington, part of a senior living cooperative. Florence is telling me about the moment in 1977 when she and Jack put their home in Kennewick, WA, up for sale. Jack was one of the leaders in the People of Faith prayer group, and several of the members felt called to move to a city with a covenant community. They had seven children, and no certain plan for a job for Jack, but they made the decision that their destination would be the Twin Cities, where they would join the Servants of the Lord community (later Servant Branch), and their house sold within a week. names but how to walk. Despite all this, the Wrights lived relatively independently until the fall of 2015, when Jack’s memory began to worsen. “If he’d start something, he couldn’t finish it because he couldn’t remember what he was doing,” Florence told me. It was time to move. Things went smoothly during the first winter in the apartment, but when spring came Jack started feeling the urge to get outside. As Florence was getting ready to go to an exercise class, Jack announced, “I’m going for a walk.” Florence tried to convince him not to go, but Jack insisted. He went for a walk and was waiting for Florence in the apartment when she returned from class. The next week, when it was time for Florence’s exercise class, Jack wanted to go for a walk again. Florence called Ralph Laven, who lives one floor up with his wife, Alice, and has been Jack’s head for many years. After Florence returned from class, she and Ralph watched out windows on opposite sides of the building, anxious for Jack’s return. “We saw him after a while, and he obviously didn’t know where he was going,” says Florence. Of the 473 covenanted and underway members of Servant Branch, a quarter are over age 70, and three-quarters are older than 50. In light of this, in 2014 Joel Kibler (then our principal branch coordinator), asked Mick Coleman to head a committee on aging. The committee, made up of Mick, Meg Ferber, Nancy Caneff, Beth Fondell, Pat Flynn and Marty Willard, has three goals: to provide a clear picture of the needs of aging members over the next 25 years; to write an assessment of resources in the branch and in the Twin Cities; and to assist the coordinators in plans for caring for the elderly. 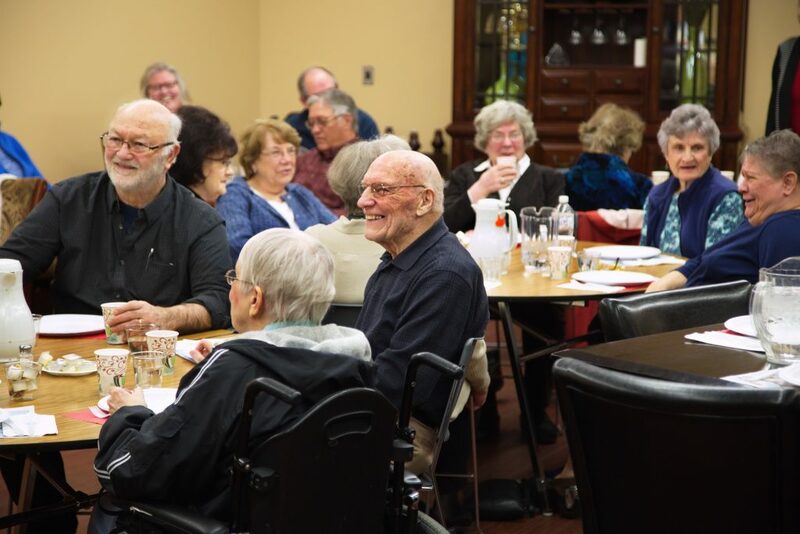 In the spring of 2015, their work involved gathering information, collecting suggestions and running a series of forums for branch members about aging. Over the last year, the team has continued their research, with Mick reporting back to principal branch coordinator Tom Caneff every two or three months. Wanting more help with Jack, Florence told the caregivers’ group about her exercise class and Jack’s desire to walk. The exercise was important to her — it greatly reduced pain in both of her legs from pinched nerves. Working with Florence to determine what would help her, Mick organized a schedule of branch members to sit with Jack for an hour three times a week. 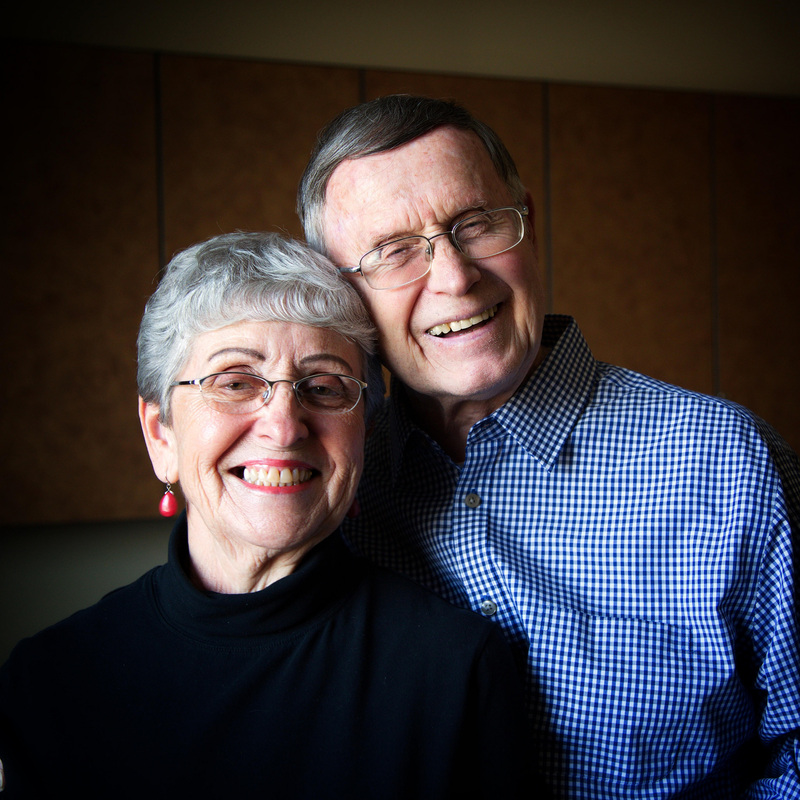 Jack and Florence Wright (Servant Branch) have both benefited from the love and service of their brothers and sisters in Christ in the aftermath of Jack’s traumatic brain injury. “Jack just loves to gab,” says Florence, “and he loves to have People of Praise members come over. He’ll ask, ‘Who’s coming today?’ They’re his friends, see.” Sometimes the visitors just sit and talk with Jack in the apartment, and other times they take him out for a drive or along on an errand. “Jim Cahill took him to a new grocery store where he buys his vegetables,” Florence says. “They have good bargains. One day, Jack brought home a big turkey leg to eat.” Mick recently drove Jack to St. Paul to see the ice castles on display for the city’s yearly Winter Carnival. One method Meg has found helpful over the years is to arrange a schedule of visits for a sister in a nursing home or senior living facility, so that one or two women will visit every week. The women making the visits might come only once a month on a rotating schedule, so the time commitment is doable. Meg recommends keeping the visits short, around 45 minutes. One or two visitors is a good number, because they can concentrate the conversation on the sister being visited, who might have difficulty with hearing or memory. 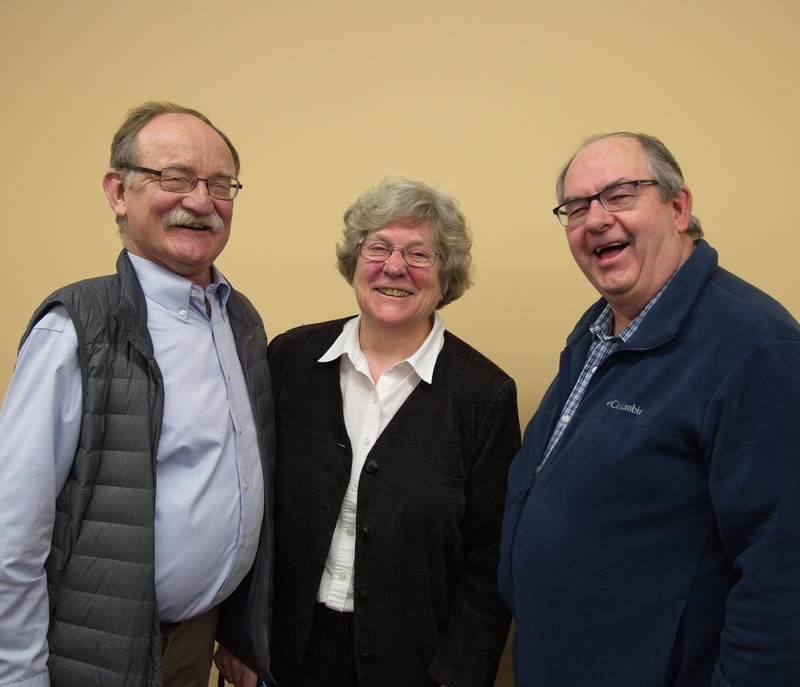 Mick Coleman (left), Meg Ferber and Pat Flynn form part of the backbone of care for the elderly in Servant Branch. As the branch has put thought into how to care for seniors, a myriad of other little ways to help each other have sprung up. There’s a small group of women created by Connie Schrandt and led by Ruth Jorgenson who get together regularly to spend a morning making soup and freezing it in single servings. These are stored at River Ridge, where any senior who would find a meal helpful can take one home. There’s also a closet on the second floor of the building filled with donated medical equipment that’s available for anyone who needs it: wheelchairs, walkers, bath chairs, and even a power chair. A live videostream of Servant Branch meetings on the Internet has made it possible for some branch members who can’t be there to participate a bit more fully. Sometimes the seniors themselves are the ones finding ways to serve. Ralph and Alice Laven are Jack and Florence Wright’s regular ride to branch meetings. When Dawn Whittenburg’s mother moved from South Dakota to the Ebenezer Ridges facility in Burnsville to be near her daughter, Barb Van Natta signed up on the schedule of women visiting her. Barb lives at Ebenezer, too, and she takes her walker and sometimes pictures of her grandchildren down the long hallways to another wing to see Dawn’s mom. Patricia Ficker surveys the delicious meal made by Carolin Faytle. The branch’s senior luncheon has become a hub for seniors to relate to one another and share ideas. Harold Coulter, the branch’s business manager, organizes eight lunches a year. After a short prayer, everyone shares a meal homemade for every event by Carolin Faytle. 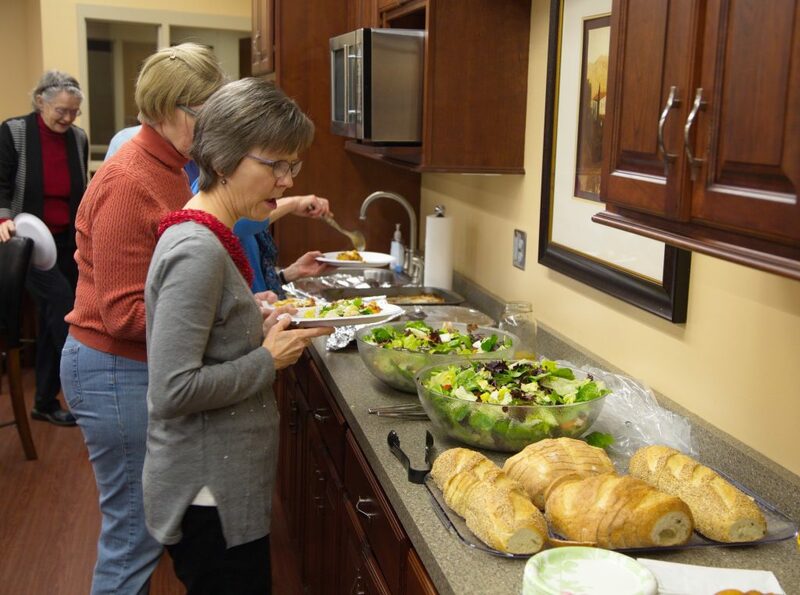 (February’s luncheon featured baked stuffed shells, french bread, salad and Amaretto cake.) Then there’s a speaker on a topic of general interest. There’s enough space in the family room at River Ridge for about 40 people to attend each luncheon, and there’s often a waiting list. Presenters have included Peggy Dietzen sharing her knowledge as a docent at the Minneapolis Institute of Art, David O’Hanley, a Trinity science teacher, speaking on fracking and climate change, and Bruce Olson, owner of Truestone Coffee Roasters, giving a demonstration of coffee cupping, which is a little bit like wine tasting for coffee. At the December luncheon, Louis Grams usually plays piano during lunch and leads carol singing afterward. At one senior luncheon, Claire Pintozzi had an idea—“We ought to have a little thing just for us in the newsletter, things that just concern seniors.” With some computer help from Connie Schrandt, Claire’s “Senior Notes” now gets emailed out along with the branch newsletter. Claire includes updates on branch activities for seniors and gathers ideas about free activities and discounts available in the Twin Cities. She also passes along tips for dealing with such topics as doctors and insurance, starting a garden in the spring, and buying a plot in the People of Praise section of Resurrection Cemetery. Thank you , Elizabeth, for this beautiful true story of our covenant life.